Historically apple cider vinegar has been used as an ingredient for recipes that aim to cure illnesses a person has. 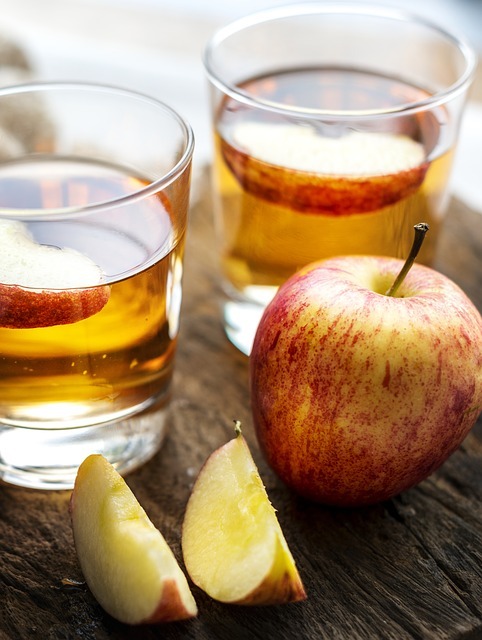 Ranging from typical physical setbacks like dry throat and the common cold to more serious ailments like lingering infections and diabetes, apple cider vinegar has proven to be very useful. There are positive links between apple cider vinegar and gout which outweigh all the possible setbacks. This special vinegar is first made from fermented apple cider. Apples are crushed and pressed to make fresh apple cider. A fermentation process that only takes two steps will turn the apple cider into vinegar. The natural fermentation process is sped up by adding yeast. All the natural sugars in the cider turn into alcohol after the yeast is added. Acetic acid bacteria then takes over and converts the alcohol into acetic acid, which is the central component of vinegar. This entire process can take multiple weeks. Where to go to get apple cider vinegar that is beneficial for your body may be tricky. Most of the vinegar products you see in grocery stores are processed. The beneficial type of apple cider vinegar is one that is raw, unprocessed and organic. This type of apple cider vinegar is rich in enzymes and acids that have multiple health benefits. It is important to take a raw and organic kind of apple cider vinegar for the sake of one’s health. Places like health food stores, warehouse stores and some of the larger scale grocery stores sell this kind of apple cider vinegar. Apple cider vinegar has a biological effect that is alkaline-forming because of its chemical interaction in the body. Once the body processes this acid, the alkaline-forming state is created by stimulating the digestive juices which include bicarbonate. A juice released by the pancreas, bicarbonate is highly alkaline that neutralizes acidic vinegar and stomach acids and promotes a proper pH balance. Since its core ingredient happens to be apples, this special vinegar contains malic acid, which is a chemical that can be found in fruits and wines. Sometimes used for medicinal purposes, malic acid is normally taken by mouth for fibromyalgia. In foods this acid is used as a flavoring agent, but it has proven to help the human body in an energy-making process called the Krebs Cycle. This process helps take away dead skin cells when malic acid is applied to the skin. Apple cider vinegar contains a wide variety of antioxidants that keep the human body healthy and operating smoothly. One of these key antioxidants would be gallic acid as its derivatives have been found in multiple phytomedicines with great biological activities such as radical scavenging and apoptosis of cancer cells. Due to the fact that antioxidants attack free radicals allows apple cider vinegar to be regarded by most medical experts as a disease preventative. For various other health conditions taking only a teaspoon of apple cider vinegar mixed in a glass of water twice a day can cure a person. However, in the case of gout attacks a person can only get reasonable results if larger amounts are consumed, such as 1 to 2 tablespoons of apple cider vinegar 2 to 3 times a day. A single tablespoon of apple cider vinegar contains 11 milligrams of potassium which is helpful since potassium works to prevent any build-ups of calcium in the joints. Uric acid is at the core of developing gout, and one of the main culprits in allowing gout to develop is a person’s kidneys. Without the kidneys properly functioning, gout could have a strong presence in the body. Kidney stones can be one harmful by-product of uric acid and some stones are a result of potassium deficiency. Potassium is critical for the body’s growth and replacing and repairing older body tissues. It normally doesn’t matter how much water is included when a person consumes apple cider vinegar along with it. Drinking this mixture in either small shot glasses or taller glasses will work just the same for gout-sufferers. Along with internal consumption of apple cider vinegar there are ways to apply topical use of this substance. For starters you can soak a cloth in apple cider vinegar and then wrap that cloth around a toe, foot or knee that is experiencing a gout attack. You can also store apple cider vinegar inside a spray bottle. By spraying this vinegar onto the affected area on an hourly basis throughout the day you can take care of your gout attacks. It also helps to store this spray bottle inside a cold refrigerator as well since colder temperatures bring extra relief with each application. Speaking of colder temperatures, freezing apple cider vinegar in an ice tray to make ice cubes also helps treat your gout. By applying these ice cubes directly to affected areas you give yourself a great chance of zapping the impact of the gout attacks. Uric acid is an important factor in determining how severe a person’s gout attacks are. Consider this Japanese study of acidity levels in urine where researchers found that acid in the urine actually prevents uric acid from being properly excreted from the body. Part of the conclusion of this study is that the less acidic the urine is, the more uric acid can be carried out of the body. Depending on the foods you eat, your urine acidity levels can be affected. The core ingredient of this special vinegar is apples, and apples themselves have anti-inflammatory components that help prevent gout attacks. One key anti-inflammatory component you will find in apples would be quercetin, a flavanoid antioxidant you will find in various fruits and vegetables. Quercetin can be exclusively found in apple peels, so by no means should the peels be discarded. Lab tests also show that quercetin can help address health conditions such as cancer and heart disease. Consumption – How Safe or Unsafe? One question that will arise when any person starts taking apple cider vinegar will be how safe is it to consume. Fructose and alcohol are two of the most important elements to avoid consuming when maintaining a healthy gout diet, and you will be glad to know that apple cider vinegar contains neither of these elements. Most apple cider vinegar products you buy at the grocery store don’t have alcohol listed as an ingredient, so if it’s not on the label then it’s not in the beverage. Apple cider vinegar by itself can help those who suffer from gout, but there are ways to spruce up this substance. One example would be the addition of medicines like benzoic acid. Especially when the urinary symptoms of gout become more visible it makes more sense to consume benzoic acid. While this medicine is more normally seen as an ingredient in soft drinks which are not healthy, this acid is very potent in treating gout symptoms. It is suggested that 5 drops of Benzoic Acid 30c in water twice a day for a week should be applied to start a routine for elderly gout-sufferers. What would make a powerful anti-inflammatory combination to fight gout would be to mix apple cider vinegar with turmeric extract, which historically has been a reliable herbal remedy in countries like India. Considering turmeric’s ability to neutralize free radicals in humans, the application of products such as Pura THRIVE Liquid turmeric extract allows for a faster absorption rate in the human body. There are ways to bridge the gap between apple cider vinegar and gout and repair your body back to good health. The overall use of apple cider vinegar is very flexible as it can assist the body in repairing damaged joints and reversing the effects of gout attacks. Whether a person drinks this substance or applies it to their skin topically, the healthy components of apple cider vinegar give the body the support it needs to break down uric acid and prevent it from building back up. Can Herbal Remedies Fight Gout?